This chapter has a title that I’ve never seen in a book before…I’ve had wedgies but I’ve never imagined what it would be like to have a “1700 year wedgie”. Of course, that statement alone should raise your curiosity. Essentially, this chapter is about “shooting yourself in the foot”…it concerns itself with taking a quick look at what occurred when the movement of “The Way” or what has for many centuries been called “the Church” transitioned from being an organism to an institution – in other words, the chapter takes a peak at Christendom. Now, you can read many other books about Christendom (its rise and fall) by taking a look at what is available on the Net and on Amazon. Even so, Hugh and Matt give the reader in this chapter a snapshot take on this crucial topic. “They were persecuted, on the run, without buildings or financial resources. They didn’t have a bible or paid pastors to help guide them. They were held together by community, the teaching of the apostles and the Holy Spirit. This type of church sounds great in some ways but it was also riddled with strife, doctrinal struggles, ethnic disputes, and that pesky problem called “martyrdom”. This ancient church was, for many reasons, a marginalized people, a “counter-cultural” movement." The authors take these historical facts and insights and spin a very compelling argument regarding the values that were embodied in this early movement of Christ followers that need to be embedded within our faith communities in the present. They discuss sacrificial community, communal transformation through loving confrontation, and the value of being a ‘sent’ community. In this last instance, Hugh and Matt outline the “talk” that they give to people who seek fellowship in their own faith community and how the passion, persistency and non-negotiable focus on “mission” shapes every conversation. This part of the book (page 54) is worth a meditative look. “…we’re still entrenched in Constantine’s Christendom way of church. Church is a place you go to, and the commoners don’t have much to do in the way of mission because the paid pros do it for them. We show up to church to get what we want (which is feeding from the leader), not what we need (to feed ourselves and others). And if we don’t get what we want, we head to the basilica next store because that chaplain is better at giving us what we want”. A bit tough huh? Sometimes you have to confront the truth…even if it is bit hard to swallow! The name of the game today in “churchworld” is competition…despite all the talk about different paradigms in ministry, most churches are in competition with each other for a “shrinking” audience. This past Easter, I think we received at our home mailbox about 4 flyers from local church “startups” (you know what I mean, those entrepreneurs who are attempting to start a mega-church with a worship team they moved in from out of town with the young, superstar aspiring preacher) that said, “come to our church – we do children’s ministry better, we worship God more deeply and we preach God’s Word more authoritatively than ANY OTHER church in town (especially the church you are currently going to).” I think you know what I mean! Chapter 5 in The Tangible Kingdom discusses the “moving violations” that Kingdom people seem to stumble upon when trying to take baby steps into living in a renewed sense of faithfulness. Besides talking about the “we do church differently” problem, Hugh and Matt outline a few others that, if there weren’t so tragic, would be a bit funny. The issue remains the same – when change is in the wind, even if the Spirit of God is attempting to bring about that change, there is resistance. Whether people want to power up on others through mindless comparisons, or if they want to be the only ones on the block to hold on to what has been tried and true, or if they are handing the pressures of ministry by sticking their head in the sand and praying it will all go away…every strategy essentially comes from the same foundation – fear. It is hard to truly understand what it means for people to change. Change has to do with purposely embracing disequilibrium…it is actually walking around with “dis-ease”, feeling like your world is falling apart as you enter a new world. If there is one thing I’ve learned about studying the story of Moses and the people of the Exodus is that God had to take the children of Israel through the crucible of the wilderness to prepare them for a new life. Deconstruction was what it took to transform a slavery oriented people into a free, responsive people…people who listened not with fear to their taskmasters but who responded in love and obedience to Yahweh. As followers of Jesus enter a “new frontier” of missional ministry, there will naturally be fears that have to be confronted. Moving into a new paradigm is not easy…to move from primarily being “inreach oriented with occasional outreach programs” to being a community that is “outreach oriented with occasional inreach programs” is a HUGE step. When we no longer depend on an Attractional methodology for our ministry but move into an incarnational model where followers of Jesus are imbedded in relationships for the purpose of transformation and redemption…things are bound to get a bit confusing. Change can be brutal…but that’s what God wants…look at the scriptural witness and you’ll see the same as I have seen – God calls for, longs for, and inspires NEW life. So, if God looks for us to “trim our lives” to be able to be ready for mission, what is it in YOU that you may need to trim? What are the essentials that you need to be ready for the leading of Jesus in a new way? I used to live in sunny Cali – home of beaches, Disneyland, traffic, In and Out (if you have to ask, you are out of it), and earthquakes. Several shakers have knocked me around pretty good. Everyone was a wake up call…the earth is beyond our control. The next chapter in The Tangible Kingdom is entitled, “Tremors”. Many of us have realized that the foundations of Christendom have been not only shaken to the core but have completely been annihilated. That causes many of us, according to the authors, to discern that we as followers of Jesus (individually and in community) are in a huge mess. Yes, we have hearts for the “sojourners” in life who need a deep drink from the well of God’s mercy, life and grace…that’s a heart breaker. But we are also tired! We are tired of church growth formulas, ego driven conferences, “success” strategies promoted by the Creeks and Backs and Keepers and every other movement out in culture. Tons of ministry leaders and your average “Joe and Jackie” Christian are burned out – we’ve put our lives on the line for Jesus and we haven’t seen results (at least the kind of results that merits a book deal or some national recognition). Many people are also fearful…change and transformation calls us all to have to deal with “cheese that has moved” (again, if you have to ask, you might be irrelevant). Jerusalem Christians = those who see the person of Jesus through their traditions and the literal interpretation of doctrine. Often Jerusalem Christians turn belief into dogma…dogma that often makes the life of Jesus hard to see. These are people who “tend” to be more literal and conscious of doing church “right”. Gentile Christians = those who see the Christian message through the person of Jesus and the narratives about his life. They tend to deal more honestly with grey areas of life and praxis. Their pressing question in this chapter, instead of simply hammering away at a stated bias, is simply this – WOULD CHRISTIANS TODAY BE DIFFERENT IF WE ONLY HAD THE FOUR GOSPELS TO INTERPRET? Would it be better “on the streets”? They think so…yes, admittedly, we would miss out on the rich theology of Paul, Peter and others…but at least we would “default” to thinking LIKE Jesus and living more LIKE Jesus. Everybody has a story. Everyone has a life that is lived with shared experiences with others but with a twist of humanity that marks each life with a stamp of uniqueness. 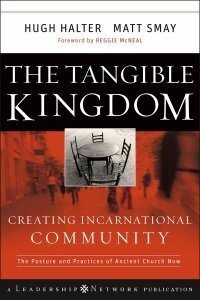 The Tangible Kingdom opens with a story…a story of a leader; a person who loves God and loves what God has done and is doing in our world through people. Hugh Halter has spent many of his days planting churches and training church planters…chapter one is his summary of why he does what he does. His main motivator? What gets him up in the morning? An incurable curiosity about people who don't know/follower Jesus. "when I walk into Starbucks, I don't think about coffee…I ponder the lives of everyone I see. I wonder about the spiritual journeys, their highs and lows…and where they look for direction in their search…"
It was a collapse of a church plant that initially appeared to be "successful"…"irreconcilable differences" that led to a breakdown in spiritual community, a smashed cell, a resignation and a self-imposed "exile" from organized church that was the beginning of a new birth in Hugh. As Hugh mentions on page 4, "my dream church became my nightmare church". "I just talked about the only thing I knew they might like – Jesus and the alternative world he called, the Kingdom of God. They loved it just as much as I did, and lapped it up like hungry pups." Out of his jadedness, God called him to a new vision and, while "messing with him", led Hugh to a new home, a renewed spiritual passion, and a new dream of a greater church and maybe another small church that someday could be an easy and relaxed home for searching souls like Fiona and her friends. A broken heart and a "tapping out" of organized, traditional, institutional church actually became the seed bed for a lifestyle of living the Kingdom that has taken Hugh for the ride of his life. Tomorrow…chapter two. In the meantime, ask yourself about your vision for your life…what is the part you play in God's desire for the Kingdom of God to be experienced in the here/now? Are you satisfied, stifled, frustrated, apathetic with what you experience? More to come tomorrow as The Tangible Kingdom begins a frank look at the reality of "church". Come back and see us, OK? 1. capable of being touched; discernible by the touch; material or substantial. 2. real or actual, rather than imaginary or visionary: the tangible benefits of sunshine. 3. definite; not vague or elusive: no tangible grounds for suspicion. descendants would be as numerous as the stars in the sky (Genesis 15). who love and serve Jesus. journey as people of God.